One of the biggest struggles that we hear from our patients on Long Island is not having a well-defined stomach. No matter how hard they work out, they can’t lose the extra fat. If this sounds familiar to you and you’re ready to transform your abs and stomach muscles for the beach this summer in Long Island, then call our office today to schedule your free abdominoplasty procedure with Dr. Schwartz. Whether you have love handles or excess skin due to pregnancy, Dr. Schwartz is the surgeon of choice on Long Island for abdominoplasty surgery. If you're not sure you what surgeon to turn to for a abdominoplasty on Long Island, then call our office to set up a free in-house consultation appointment today with Dr. Schwartz. He will take the time to sit with you to make sure you are a good candidate for having a abdominoplasty. Dr. Schwartz is here to sculpt your stomach for the beach this summer on Long Island. Get rid of that waistline that's just driving you crazy! Just give our office a call or fill out our online form for more information. No matter how many abdominoplasty surgeons you have consulted with on Long Island, there is one surgeon you have to consider, and that is Dr. Schwartz. He will do more than make your abdominal area firmer and smoother; your waistline will be free of excess skin and fat that you simply can't get rid of with diet and excersise. Abdominoplasty (“tummy tuck”) surgical treatment is one of the most popular treatment we conduct at Cosmetic Plastic Surgery Long Island, and one our experienced cosmetic surgeons feel especially enthusiastic about. Right after carrying a child or substantial weight loss, the skin and muscle of the stomach can extend and a person may be left with a bulge around his / her waistline. Stomach muscles can also separate, therefore making the situation far worse. A tummy tuck, or mini-abdominoplasty can provide you with a flatter, firmer stomach to improve the way in which clothes fit your body. The abdominoplasty isn't a weight loss surgery or a alternate for diet and exercise. The right patient we work with on Long Island is an adult who is in good health and possesses reasonable expectations of the outcome. The results of having a abdominoplasty are fairly quickly. 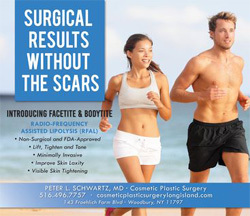 At Cosmetic Plastic Surgery of Long Island, we assist patients from all walks of life who feel self-conscious or physically uncomfortable with drooping skin on the tummy. Our compassionate staff and highly trained surgeon work closely with every patient to create a treatment plan that addresses your concerns and provides the outcome you’ll love. The abdominoplasty procedure requires a horizontal incision to be made in the area between the pubic hairline and navel. Dr. Schwartz will allow the amount of extra skin present to determine the shape and length of the incision. Through the point of incision, Dr. Schwartz will repair and tighten weakened abdominal muscles. In order to perform a full abdominoplasty, Dr. Schwartz will make a second incision in the upper abdomen in the area around the navel. While a abdominoplasty will produce a flatter, tighter stomach, depending on the specific case, Dr. Schwartz may recommend liposuction accompanies a abdominoplasty to remove excess fat.